Well the Missus and I trundled downtown to catch Hershey Felder As Irving Berlin at Emerson’s Cutler Majestic Theatre (which really is majestic) and, say, it was . . . Swell! Swell! Hershey Felder – who wrote and performs the show – does a terrific Ethel Merman. Not to mention a terrific Irving Berlin. Heralded as “the greatest songwriter that has ever lived,” by George Gershwin, Irving Berlin is known for innumerable American classics such as “White Christmas,” “God Bless America,” “Anything You Can Do,” and “Top Hat, White Tie and Tails.” Songwriter Jerome Kern said it all: “Irving Berlin…IS American music.” In this tour de force performance by award winning showman Hershey Felder (George Gershwin Alone and Maestro: Leonard Bernstein), the remarkable story of “America’s Composer” comes to life. We’re taken from the depths of anti-Semitism in Czarist Russia to New York’s Lower East Side—and ultimately all of America and the world. Featuring the composer’s most popular and enduring songs and beyond, Hershey Felder’s masterful creation of character and musical performance makes this evening with Irving Berlin an unforgettable journey that epitomizes the American dream. Sure, some of the production is hokey, but so was Berlin. Over all, though, it’s an illuminating review of a Great American Songwriter. Chronological list of Berlin’s songs via (God forgive us) Wikipedia. Not surprisingly, the Boston Globe’s redoubtable theater critic Don Aucoin can give you a better sense of the production than we ever could. 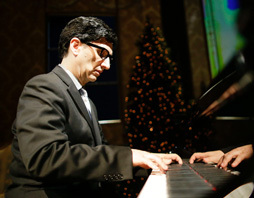 But we do say this: Catch Hershey Felder’s performance. Through August 2. This entry was posted in Uncategorized and tagged Boston Globe, Don Aucoin, Emerson's Cutler Majestic Theatre, Ethel Merman, George Gershwin Alone, God Bless America, Hershey Felder, Hershey Felder As Irving Berlin, Kate Smith, Maestro: Leonard Bernstein, Wikipedia. Bookmark the permalink. Hershey Felder is a genius storyteller. In a league with Anna Deavere Smith, and that’s a tough league indeed. Can’t wait to see this. I believe ice packs will reduce all that “swell”-ing quickly and without side effects. We ordered tickets for our Boston visit ( based on your review). Looking forward to seeing it. Look forward to seeing you as well.